with rising star Vladimi Versailles from the film "Mooz-lum"
The Chew Chronicles got a chance to chat with Vladimi Versailles from the newly released independent film “Mooz-lum”. The film follows the character Tariq, played by Evan Ross, through his experiences as a young Muslim in college, post 9-11. 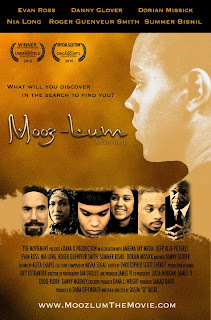 A groundbreaking film, Mooz-lum gives audiences an inside perspective into the experiences of several young Muslim Americans. Rising star, Vladimi Versailles, portrays the character, Cedric; a complex character who struggles to understand his friend Tariq’s religious beliefs and customs. Versailles describes his character as one who “plays America”; revealing society’s lack of understanding of different ethnic groups. After high school, Versailles headed to New York City. Originally wanting to attend Fordham University, like the iconic Denzel Washington, he opted to enroll in Marymount Manhattan College, where he received a scholarship. Versailles wasted no time getting involved in the New York theater scene. 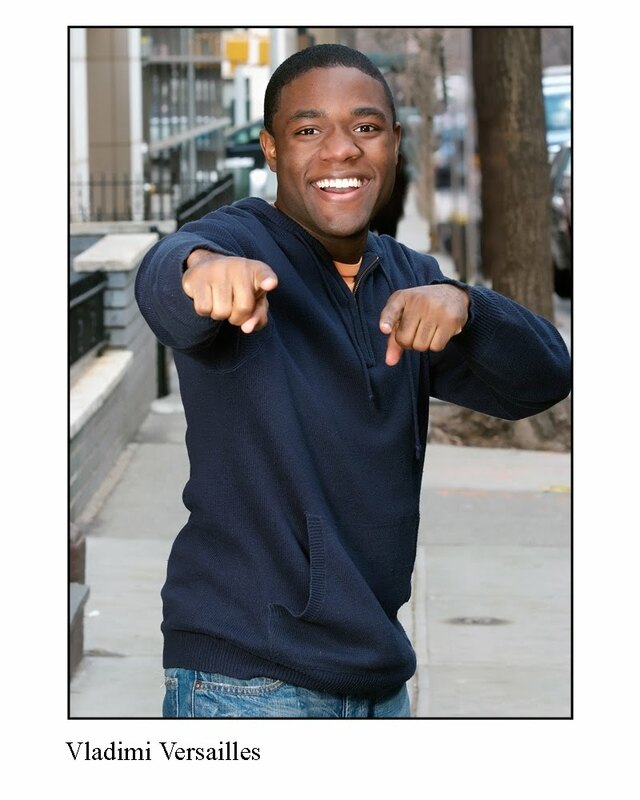 Against the wishes of Marymount’s theater program, as a college freshman, he began to audition for Broadway shows. He describes these experiences as daunting and difficult, because of his lack of professional theater experience. “It was good, because it taught me that you have to go get something. Nobody in NYC is going to give you anything.” Yet, his perseverance paid off throughout his college years; and by his junior and senior year he was booking several commercials and even managed to graduate school early, because he was so eager to finish. “The year I graduated was the hardest time because of the economy and all the strikes. But I booked my first gig doing a Black History tour for McDonalds.”- Yet, while working on this gig, Versailles was being considered for a role in the film “Cadillac Records.” -which created a conflict of interest with the Black History tour. “I got fired because I was already working on a show and they didn’t want me to be on this film.” And unfortunately he was eventually passed on for the role in Cadillac Records also. –Which led him to accept a job at The Shakespeare Theatre of New Jersey. What’s next for this determined young thespian- he recently wrapped on an independent film, “For Flow”; which began as an off-Broadway production and is loosely based on the play “Waiting for Godot”. The film has also been recently accepted by the Texas Black Film Festival. His other upcoming projects include roles in several other independent films soon to be released. Last night I had the pleasure of attending New York’s infamous “Le Cirque”, located in the Bloomberg building on East 58th St. I must admit, walking through the Bloomberg courtyard and into the restaurant, gave Le Cirque an allure from the start. You immediately notice the lavish decorum, polished staff, and elite clientele when entering. The hostess immediately greeted me with delight and inquired about my reservation. I arrived a few minutes early, so I was asked to have a seat with my friend in the lounge area, until our table became available. After sitting, my friend and I were immediately greeted by a waitress, who asked if we would like a drink while waiting. –Needless to say, I was already blown away by the hospitality. Yet, my friend who arrived earlier than me was singing a different tune. She mentioned that after arriving and mentioning my name for the reservation, the hostess smugly told her to have a seat in the lounge. Also, for the entire 20 minutes that she waited in the lounge for me to arrive, not once was she greeted by a waitress or asked if she would like a drink–which struck me as shocking, because I had yet to experience this. After waiting 15 more minutes after our scheduled reservation time, we were escorted to our table in Le Cirque’s Dining Room area, which can only be described in one word- lavish. The area was dimly lit and decorated with supreme elegance. After being seated, we were immediately asked for our drink and wine selection. I ordered a glass of Bordeaux. –which was very flavorful and smooth. The waiter also brought our menus and an array of tasty bread selections, which we snacked on while waiting to order our meal. After making our dinner selections, drinking half of my glass of wine, and eating more than enough bread, and suffering about 20 more minutes of hunger, we finally flagged down a waiter. Annoyed and famished, we placed our order and accepted a sincere apology from our waiter. Obviously our waiter understood our frustration, because the entire dining experience improved dramatically thereafter. We were promptly served our appetizers which were both intriguing and delicious dishes. I had the Parsnip Veloute- escargot and parsley soufflé, and my friend enjoyed the Pheasant Tortelli- dried fruit vinaigrette. The Pheasant Tortelli was far better than my escargot dish. Yet, I was seeking to try something new and my soufflé serve its purpose. 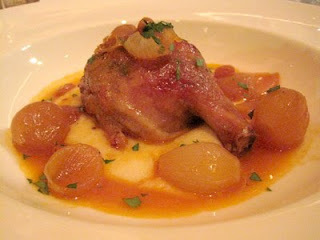 For my entrée, the Duck Jambonette- sweet and sour pearl onions with creamy polenta. The dish was absolutely savory. The duck was seasoned to perfection and the pearl onions were covered with the perfect mix of bold flavors. The duck was succulent, meaty, tender, and laid beautifully over the creamy polenta. My friend’s dish, the Grilled Daurade Royale Fillet was decent, but not near as amazing as the duck. This fabulous 3 course meal was topped off with an amazing desert experience. Chocolate Cannelloni, “Le Cirque” Crème Brulee, and our waiter served us a complimentary selection, the Classic “Baba au Rhum.” The Chocolate Cannelloni was perfection; crispy and chocolaty shell with a sweet and creamy filling. The cannelloni was also served with tasty gelato. 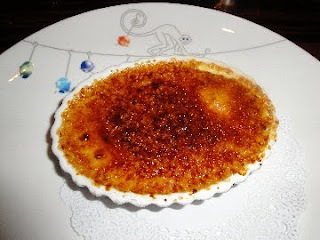 The “Le Cirque” Crème Brulee was a simple treat; light but very tasty. The Classic “Baba au Rhum” was definitely a winner; sweet, spongy, with hints of rum. After taking the last bite of our dessert, it dawned on me how completely stuffed I was.-Which I was not expecting from ordering restaurant week menu selections at an upscale restaurant. In my experience, these types of establishments never serve you enough food; but Le Cirque convinced me otherwise. When leaving, the hostess and staff graciously thanked us for dining there and even asked how we enjoyed our meal. Elegant, courteous, and delicious- my experience at Le Cirque started somewhat rough but ended delightful by the end. Taking advantage of this fine establishment during NYC Restaurant Week is something you won’t regret. While it seems hip-hop is making a departure from its original NYC native sound; every now and then a New York MC chooses to challenge this occurrence. 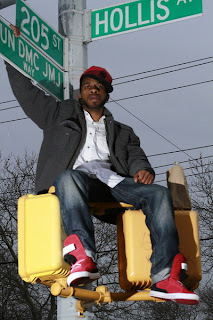 -Next up to the mic is Nock, hailing from Hollis, Queens. With a nostalgic 90’s hip-hop flow, Nock is taking us back to the days when hip-hop belonged to the “Rotten Apple”. On “Queens Finest” he gets straight to introducing himself, his sound, and his life. “I don’t condone but my past is written in stone.” He raps about serious issues in his hometown of queens; but manages to smoothly place these words over a smooth, melodic, feel good beat. On the tracks “This is Us” and “Humble Pie”- which effectively uses Tribe Called Quest‘s addictive Electric Relaxation beat , Nock manages to find a smooth balance between the aggressive sound of NY hip-hop and a laid back tone . Yet, the beats on these tracks are so memorable; almost any decent rapper could sound good over them. But Nock does manage to deliver decent lyrics and not be outshined over the classic instrumentals. Hopefully he manages to stick to the smoother and catchy tracks, which work better for his flow and makes him a more unique and marketable artists. Based on some of his work, being able to smooth out his classic NY sound is a forte he could possibly master. In today’s Drizzy, Nikki, Weezy, and Yeezy hip-hop era, just being a decent MC does not guarantee success. People want a character, a unique persona they can be entertained with. With more comedic rants, similar to the one heard at the end of “Humble Pie”, this decent MC could possibly become a star.